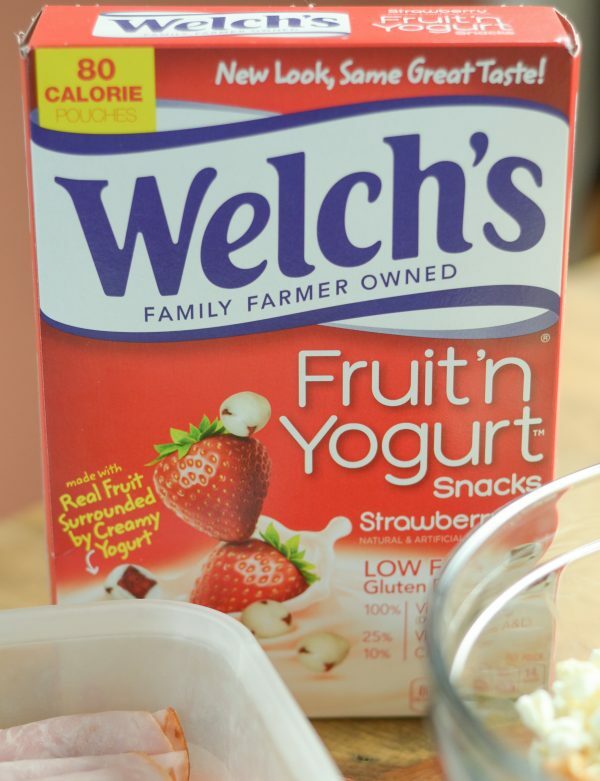 Get the kids ready to go back to school with this Fruit ‘n Yogurt Snack, plus a lunchbox idea! Are the kids ready to go back to school? I guess I should say, are the parents ready for the kids to go back to school? We are gearing up for back to school season around here. It’s a big start to the new school year, as we will now have both kids in elementary school, at the same place. I have to admit, I am pretty ecstatic. Of course, I’m a little sad too that my daughter is heading to elementary; it’s bittersweet. It’s also time to start packing lunches again. 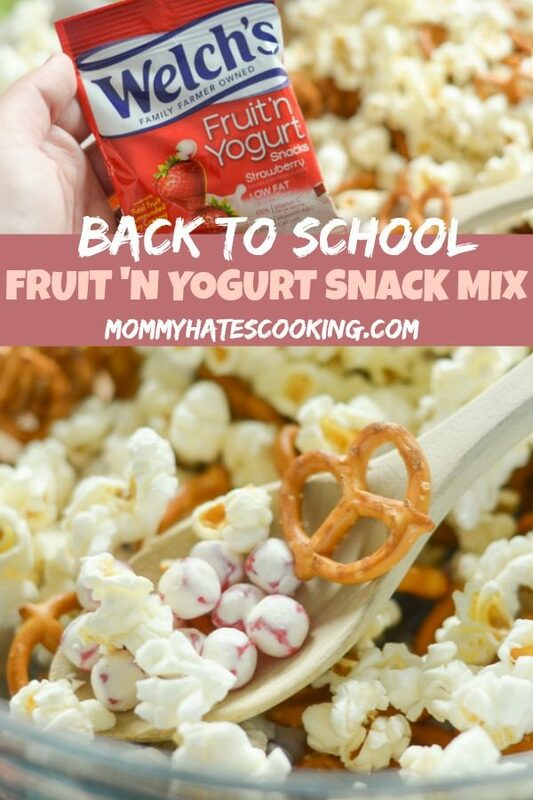 That means this Fruit ‘n Yogurt Snack Mix makes for a great addition to the lunchbox. As a mom, I’m sure most of you can relate that likely there are snacks in your purse at all times. 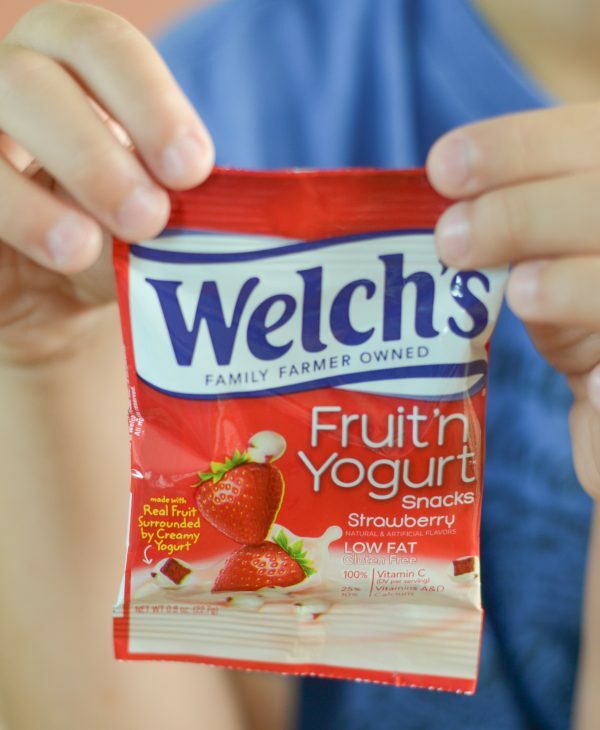 In our household, we always have Welch’s Fruit Snacks or Welch’s Fruit ‘n Yogurt Snacks on hand at all times. We are typically heading from school to an after school activity like piano, gymnastics, or football practice. The kids always need a little snack in between. 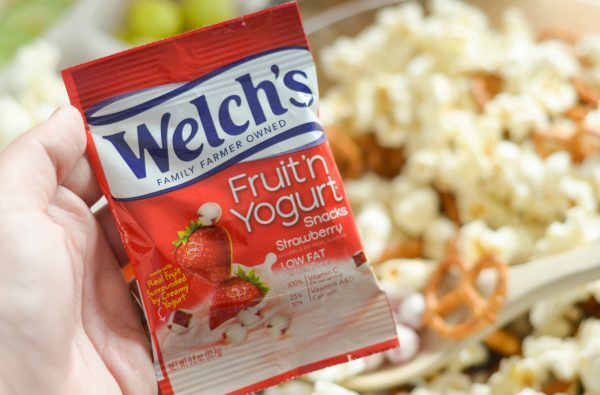 I love that I can just grab Welch’s Fruit ‘n Yogurt Snacks and it’s the perfect portion size, plus it’s super tasty too. They come in a few different flavors such as Strawberry, Blueberry, and Cherry. My son loves the Strawberry while my daughter prefers Cherry. The best part is that they are made with real fruit. 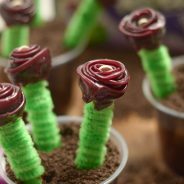 They are not only fun to eat but also super delicious. We also love to use them in a quick and simple snack mix. It’s a great mix to add to the lunchbox too. 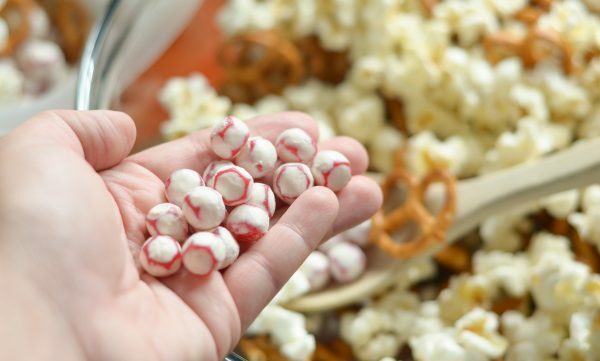 It gives them a sweet little treat, mixing it with whole grain popcorn and pretzels. 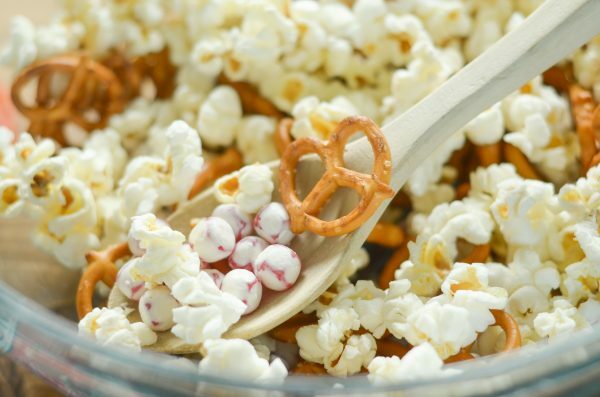 We use gluten free pretzels for this snack mix. 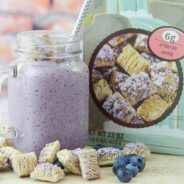 What’s in this Fruit ‘n Yogurt Snack Mix? That’s it! 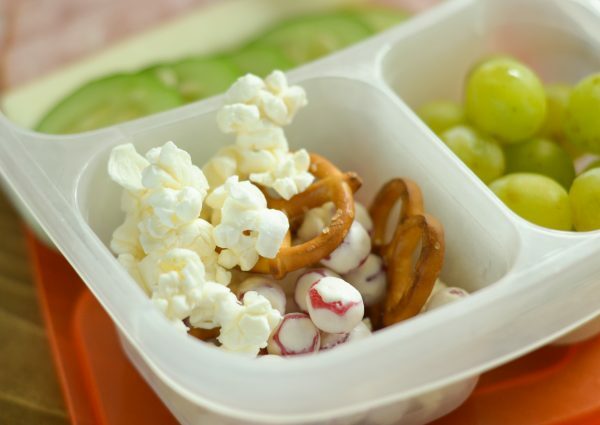 Just three little ingredients mixed together to make for a great snack in your child’s lunchbox or as an after school snack in between activities. We typically put them in little bags to keep in my purse for after school. 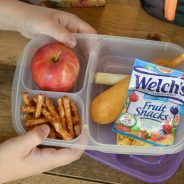 As all of us moms are getting our kids ready to go back to school, Welch’s Fruit ‘n Yogurt Snacks can help make packing lunches a little easier, available in convenient single serving pouches and they are made with real fruit providing delicious taste that my kids love. 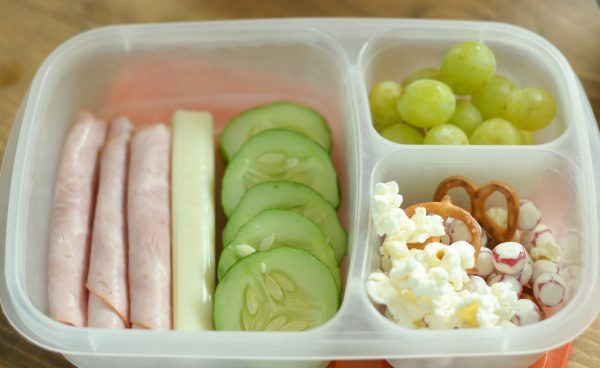 What are you planning to pack in your child’s lunch? I’m trying to mix it up this year! At least I say that now, we’ll see how it goes here in a few months. It’s time to whip up this Fruit ‘n Yogurt Snack Mix now!